University City may become a victim of the City of San Diego’s poor planning to construct a major sewer pipeline through our major streets. Are you willing to let that happen? This is much more than the temporary construction concerns such as; health hazards, traffic control, environmental problems…it means that forever U.C. may be called the “smelliest”, un-safest, most congested community in San Diego. You can join the efforts of UCCA, UCCF, and UCPG and fight this battle to save our community from the planned sewer pipeline route through our community. **Donate to the GO FUND ME** campaign at https://www.gofundme.com/pure-water-sewer-lawsuit-fundraiser?member=82992 to stop this ill-conceived idea to put our community, and our quality of life, at risk. I hope “Cinco de Mayo” activities and most certainly “Mothers’ Day” gatherings will bring you very happy and memorable times with family and friends. Those April showers we didn’t get, and the forecast of little or no rain the next few months, will make this year one of the very driest on record ! I am personally exploring a drought resistant grass for my backyard as a realistic solution of sorts. UCCA and some concerned residents met with Congressman Peters and Col. Woodworth, (MCAS, Miramar), to continue the efforts to establish a dialogue to discuss varying safety issues. 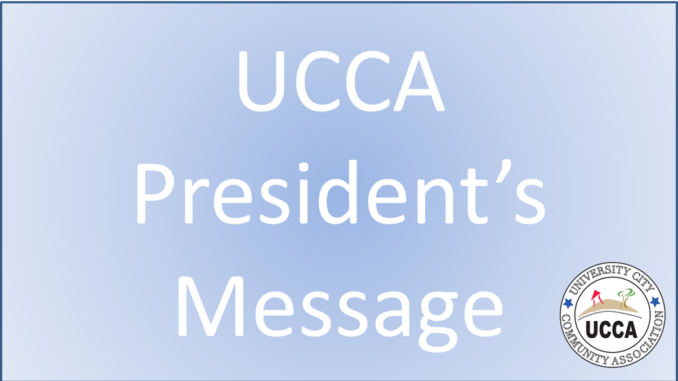 I will report on that meeting at the Wednesday, May 9 UCCA meeting. I hope all residents, in particular those living east of Genesee, will plan to attend.